What I love most about this Close Reading e-document is that it can be adapted for any piece of reading - from short articles and speeches to longer poems and novels. The teacher must select a total of 4 reading passages from the literature that students are currently reading in class. These textual selections are copied and pasted into the Model Selection and Close Reading Selection boxes. Because this is an adaptive and fluid digital document, teachers can make a copy with each use and easily share with students electronically without having to wait for or make wasteful paper copies. Close reading is a type of literary analysis that dissects every aspect of a text in order to form an argument about the text's meaning. Rather than just examining surface meaning, close reading examines word choice, grammar, literary devices, figures of speech, tone, and style. Oftentimes, the purpose of a close reading is to see beyond "the mask" of language, and to question its ideology (the values that the author wants to show in the work). This close reading activity allows students to trace patterns of imagery, symbol, or allusion throughout chosen selections within the literature in order to explain how meaning is built up around particular terms, definitions, characters, rhetorical devices or images. 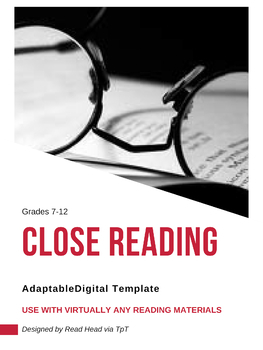 Most importantly, this close reading template is not set in stone and can be used with basically any literature that teachers are currently using. This is one classroom tool that you will use over and over again!